That looks deceptively simple. The complications come when defining the “specific scenario” and unpacking the word “useful”. One practical approach to defining various aspects of the specific scenario involves reference to an educational framework of some sort. By educational framework I mean a structured description of educational concepts such as a shared curriculum, syllabus or set of learning objectives, or a vocabulary for describing some other aspect of education such as educational levels or reading ability. Scotland’s Curriculum for Excellence which covers learning experiences as well as outcomes. the Law Society of Scotland’s Professional Education and Training requirements. various empirical measures of reading difficulty, for example general idea of “reading age” and the specific measures of reading ability and text level used by lexile. the W3C open linked education community group aims to build a subject database of wider scope. All of these frameworks (and many others) may be used to describe aspects of an educational scenario. Life isn’t simple enough for us to meet the use case described above by adding a single property to schema.org Creative Works to say that the resource “aligns with” (i.e. is useful in the context defined by) some entry or node in an educational framework. In prescribing a “useful” resource we would want to distinguish between resources that teach and asses a topic; we also want a resource that assumes suitable previous knowledge, or requires some specific reading level, or assumes a certain general academic level. There may be other forms of alignment. There isn’t agreement on a minimum core set of properties required to address that word “useful” in the use case, but there is agreement that a resource can “align” with an “educational framework” in several ways, some of which we can enumerate. Hence the birth of the alignment property and abstract Educational Alignment object. I have seen both of these mistakes in actual markup of webpages. 1. the alignment object on its own is fairly meaningless. Unless it is referenced by the educational Alignment property of a creative work it’s as useful as half a link. 2. since the alignment object is a proper schema.org Thing (to be specific a subtype of an Intangible Thing) it inherits the properties that every schema.org Thing has. e.g. a name, a URL, a description an image. Some of these make some sense in some cases (see below) but importantly, none of them are used in expressing the alignment: the url of an alignment object is not the same as the url of the creative work or the node to which it aligns. 1. Kritikos, where students can tell other students what is useful for their course. Screen shot of Kritikos information page about an MIT OCW lecture video. See it in kritikos. Kritikos is a custom search engine for visual media relevant to teaching and learning engineering. In part the customisation comes through the use of a Google CSE, but more relevant to this post is the part that comes through allowing users to classify whether resources found on it are useful for specific courses [aside: this part of the kritikos service is built on a Learning Registry node]. So, there’s an expression of an educational alignment; how does it relate to the alignment object? I’m not guessing this, the YouTube page has Schema.org microdata in it. name = "Lec 7 | MIT 16.885J Aircraft Systems Engineering, Fall 2005"
educationalFramework = "University of Liverpool  Modules"
targetDescrption = "Flight Dynamics and Control"
What about the other properties of the AlignmentObject, the ones it inherited by virtue of being an official Intangible Thing in the schema.org hierarchy? Well you could envisage the image property pointing to the screenshot above, and the url property being a url with a fragment identifier that points to the “what others are saying” part of the kritikos page. Sure, you can give it a name and descriptions if you want to. Maybe these aren’t especially useful, but the point it that they are clearly different from the url, name and description of the University of Liverpool course to which the MITOCW video aligns. I’ll cover this in less detail. The main problem with the example above is that the educational framework, while locally useful, is somewhat ad hoc we had to kind of look at the course structure at Liverpool University in a certain way to see it as an educational framework. Better examples of a more widely shared and more formally constructed educational frameworks are those of the US Common Core State Standards Initiative. OER Commons is a repository and search engine for Open Educational Resources that expresses alignment to these frameworks in its descriptions. Screenshot from a resource description on OERCommons showing educational alignment information on the right. Interestingly there is some other information given about the “degree of alignment”, i.e. how good a match that resource is to teaching that State Standard. In part the motivation for creating an alignment object class in schema.org was the issue mentioned above about not knowing what might be all the possible forms of alignment between a resource and an educational framework used to characterise some aspect of a teaching and learning scenario. However I hope the examples above go someway to showing that alignments are real (if intangible) things, you can give them URLs, and names if you want. Furthermore they do have properties. For example, they are asserted by someone: a student at Liverpool University in the kritikos example and a user of OER Commons in the other. In the OER Commons example there is other information about the degree of alignment. This goes some way to convincing me that the alignment object isn’t just some computer science trick of indirection. Thanks, Phil, it is really useful to draw attention to this – I was initially puzzled by what an alignment object was (even to me it appeared rather abstract) and you have here a pretty clear explanation that should help people. My own interest in this is in InLOC, and last summer I did draft a page on the relationship between InLOC and LRMI. 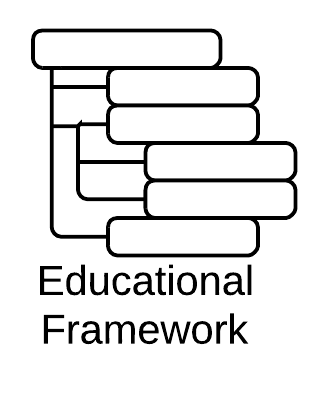 I’m hoping to find the time to contribute to the discussion on the LRMI list, but just to give a hint of my contribution, InLOC is exactly designed to give a clear formal structured representation for particular types of educational frameworks. I would look forward to LRMI including optional URLs for the framework itself and the alignment type, rather than only text fields. Thank you for this very clear explanation! The OER Commons example you mention makes use of the “degree of alignment”. This is no doubt /very/ clever! But that rises the need for an additional attribute for the AlignmentObject. Let me generalize this issue. Why is that extremely useful information not marked-up (I checked the HTML source) and is it not made available as (linked – machine understandable) data? The obvious answer is because there is no suitable property for that – but my question actually reads: “why is the schema.org extension mechanism not used in this case”? Even if that information would not be used, at the moment, by a Google search, it could be used by other people, and this is exactly the mechanism foreseen to pave the way for a future extensions of LRMI! I would really appreciate your informed comment on this. I would look forward to LRMI including optional URLs for the framework itself and the alignment type, rather than only text fields. Thanks all for your comments. Your suggestions make sense, but the first priority has to be getting people to use the Alignment Object as it is. Then we can think about whether we should add to it and refine it. In more detail: Renato it would be great to collect examples of other people who use degree of alignment, to examine whether they are indeed all doing the same thing and to gather evidence about whether it is useful as well as clever, then if we come to the point where people are demanding more detail in the alignment object we could make a case for this being added. Morpheus, the hope is that the URL for a node in a framework would dereference to more information about the framework, in other words identify the node and allow semantic web people to follow their nose in order to discover information about the framework. Simon’s work leads that way. 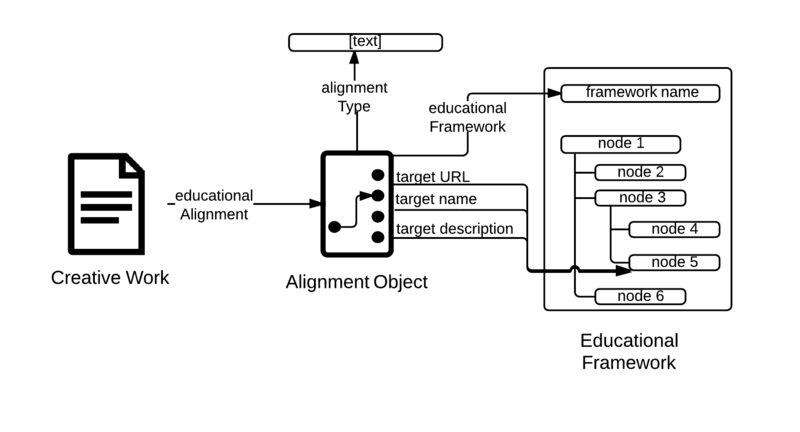 The text description of the framework and node are in the alignment object because not every educational framework is semantic web friendly and not every search tool follows links like this: without the text properties there would be no text on the actual page being marked-up that a search engine would find. You are right: the keyword is “useful”. I had a quick look to existing lrmi annotated material, to (re)discover that schema.org is used quite “creatively”. This is partially a side effect of the objective to maximize its flexibility, but the resulting lack of consistency is not desirable. Developing simple open tools (widgets like?) to support the annotation process could greatly improve the quality of annotations (I am aware of some lrmi taggers being developed). I’ll be back with some ideas to elicit some feedback, but suggestions are always welcome.